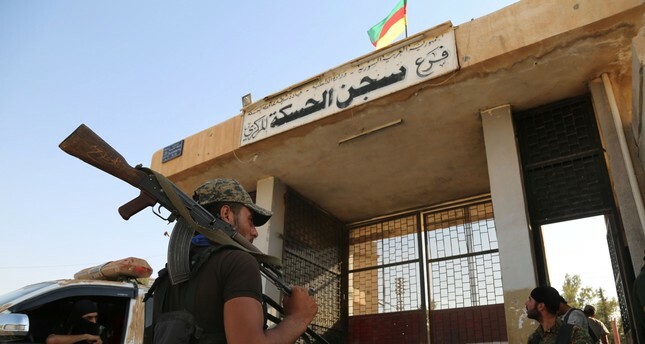 The YPG terrorists stand outside the central prison in the northeastern Syria’s Hasakeh, 2016. The PKK's Syrian affiliate reportedly completed the first step of negotiations with the Bashar Assad regime, agreeing on a decentralized state system for Syria and handing over key cities, including Raqqa and Deir ez-Zor, to the regime. According to news sources, the political wing of the Syrian Democratic Forces (SDF), the Syrian Democratic Council (SDC), and the Assad regime held the first meeting for negotiations over the weekend in Damascus. At this meeting, representatives of the Syrian regime made an offer that included several conditions for a possible agreement between the two sides. The SDF is an umbrella group dominated by the People's Protection Units (YPG), which is regarded as a Syrian extension of PKK terrorist group by Turkey, but has been supported by Ankara's NATO ally Washington in the context of the fight against Daesh. This support often causes tension between the two countries. Reportedly, the YPG will examine the regime's demands and bring their own demands to the next meeting. After discussing the demands of both sides, official negotiations will start to come to terms. In the meeting, both the YPG and regime representatives agreed that it is not possible to carry on with the current administrative system of the country and that a decentralized state structure is a necessity. To examine the technical issues that will be important in coming meetings, the parties also decided to establish joint committees "to form a road map for a decentralized and democratic Syria." Sihanouk Dibo, an adviser to the YPG, said that he expects the negotiations to be tough. "The negotiations will be long and arduous because the Damascus regime is very centralized," he said. In the list of 12 demands made by the Syrian regime, according to Kurdish news agency IMP News, a limited federation or an autonomous administration model is proposed for northern Syria. Another article includes the easy delivery of Raqqa and Deir ez-Zor to the Syrian regime. According to the demands, basic underground resources will be under the control of the Syrian regime and the fight against Daesh will continue in full solidarity. The regime further demanded that in state institutions and borders, there will not be any symbols other than the Syrian flag and the YPG will gradually put an end to its foreign connections since the regime will provide their needs from now on. Lastly, none of the YPG terrorists will be arrested due to accusations made during the civil war. Those who are wanted for ordinary crimes, on the other hand, will be handed to Kurdish security forces. SDF co-heads İlham Ahmed and Riad Darar represent the YPG in the negotiations, while the Syrian regime is represented by the deputy chief of the general staff of the Syrian regime army, Brigadier Selim Herba, who also represented Syria in the Astana talks conducted by Turkey, Russia and Iran. This marks the first diplomatic approach between the Assad regime and a U.S.-backed group since 2011. The SDF did not give a date for any new round of talks. In a news article published July 16, Anadolu Agency (AA) reported that the regime and the terrorist organization got closer and they agreed that the regime would be responsible for operating dams and other energy sources under the organization's occupation. Cooperation between the YPG/PKK and the Assad regime is not new. During Turkey's Operation Olive Branch against the YPG in Afrin earlier this year, it received help from the regime. "The Syrian regime helps the Kurds with humanitarian support and some logistics, like turning a blind eye and allowing Kurdish support to reach some fronts," said an SDF militant.